Pollutants fall into six main categories, all of which are significant threats that cause oxidative stress to damage skin health. Industrial and car emissions, cigarette smoke, ground level ozone, and the sun are all sources of pollution. They work in synergy to overwhelm skin’s internal defenses, triggering a cascade of skin damage. SkinCeuticals antioxidants prevent environmental damage, enhancing skin’s natural reparative capacity to correct and reduce visible signs of aging. 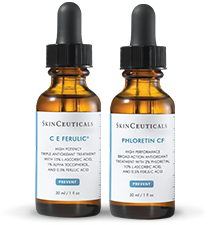 When used together, a SkinCeuticals antioxidant serum and broad-spectrum sunscreen provide the most complete protection against environmental damage and premature aging caused by pollution and sun.